Much excitement is being had in the media and whereabouts about the New Trump who has allegedly showed signs of humanity by reading from the teleprompter an inane and nebulous statement of “regret” for who knows what exactly. One thing sure is that he, incapable of empathy and especially guilt, does not know or understand it himself, nor does he want to. He’s also shown up for a photo-op in the flooded Louisiana, pretending to care. A shtick as convincing as a serial killer’s finding God in prison (which, according to expert on manipulative characters, George Simon, is a classic psychopathic move). Not to mention — although one will — that his presence there creates a distraction and headache for the security and rescue personnel. These brazenly manipulative PR moves are greeted with relief and taken as a sign of the long-awaited “pivoting” (which has to be the word of the year in 2016, mark my prediction) toward a humane and presidential Donny. But this foolish hope is just that, foolish, and one reason, among many, why people with a conscience cannot understand and spot those without it. Naivete and denial, like hope, their close cousin, spring eternal from the same source: our inability / unwillingness to face the truth. Kellyanne Conway, the new Trump handler who is most definitely responsible for the “human” Donny, is a seasoned GOP operative, thus she has plenty of experience with both lipstick and pigs. But even she won’t be able to accomplish this impossible feat of a make-up-based makeover. There simply isn’t enough lipstick in the world. And a nice takedown of the “new Trump” by John Cassidy in The New Yorker. And our journalists proceeded to discuss in earnest the difference between “jokes” and “sarcasm,” continued to wonder why Trump does not seem to be interested in “pivoting,” and engaged in mind-numbingly pointless “debates” with Trump’s thuggish surrogates whose job is to translate Trumpese into English by insisting that black is white and up is down, and anyone who does not believe so is itching for a fight. And they are all too happy to oblige. This sordid spectacle boggles the mind more and more as our media types refuse to acknowledge the reality of the man’s apparent character defect. They seem to have come to terms, as much as that’s possible, with his “narcissism;” but judging by their reactions, they do not understand well what narcissism means, nor notice Trump’s glaringly missing conscience. They smirk ironically and call him “unconventional,” which says… something. And as much as one wants to blame them (and one does), a significant portion of the responsibility for this ignorance falls on the mental health professionals who have failed in their role as public educators. And not just now. This failure to teach about character defects / disorders and their dangerous ramifications appears to be a feature rather than a bug of psychiatry and related fields, and not just American. Of course in a society where narcissists and psychopaths are admired and rewarded in multiple ways, these defects will not seem to be so defective, if at all, not even to the professionals. In a future post we’ll take a look at the various ways in which American mental health experts (not all) have misunderstood Trump’s character problem. “The coverage [of Trump] has been extremely poor in my opinion,” Johnston, who at 67 clearly still enjoys making trouble*, pronounced at no less a lions’ den than the National Press Club on Thursday night in Washington. (…) The main reason he has “been extremely critical of my colleagues,” in the media Johnston said, is they’ve been too buttoned-down and professional. “They’re covering him as though he is a serious person,” Johnston said of the Republican presidential nominee. [Trump] doesn’t want you to know about his unbelievable cruelty to others, and his utter contempt for Christians, and (…) that Donald doesn’t know anything. (…) his answers are gibberish, because he doesn’t know anything. David, from your mouth to the pundits’ ears. Let’s hope they are listening and able to hear what’s painfully obvious. *I’ve just noticed this after publishing the post. Johnston’s truth-telling is labeled as “making trouble” — and that in such a seemingly progressive publication as “Moyers & Company.” Our journalists’ job was to afflict the comfortable and to comfort the afflicted; instead, so many of them do the opposite that those who break this mold are seen as troublemakers. Donald Trump, in a phoned-in interview with CNBC today, showing, for the umpteenth time, how much he cares about the country or anybody besides himself. True to his character, he will continue his depraved downward spiral of inciting hate, violence, and mass disorder, consequences be damned. At least in warning us about it, he is honest. Sort of. And if that “truth telling” doesn’t “work” and he is not elected after all, he will go on a nice long vacation, leaving behind the sea of rage and smoldering ruins of civility, no doubt feeling great as always about a job well done. He is a killer, that Donny, and a king, as his proud daddy said. But even Trump Sr. would remind his boy not to be so tough; even he, the callous and ruthless manipulator, was concerned about his favorite son’s aggression and unbridled desire for power and adulation. Donny should have listened to his old man. If he could, that is. We’d all be better off now. There must have been a typo in his campaign slogan, and Donny either didn’t notice it or left it there on purpose, the con man that he is. Because it should have indeed read Make America Grate Again; and he has surely delivered on that promise already, many times over. Mission Accomplished, to borrow another empty slogan, from another conscience-deficient leader blind to his own hubris and folly, whose legacy of death and destruction we have still not grappled with, allergic as we are to any admission of guilt. That guy’s vices pale, however, in comparison with those of our presumptive Killer King who has promised us, repeatedly, a Trumpian Victory. And he is a man of his word. Sort of. The intense backpedaling, as evidenced briefly in the video above, has commenced immediately and continued unabated today, with Trump’s surrogates minimizing his “gaffe” (that wasn’t) as best as they could. Their trumpsplanations have ranged from ridiculous but amusing (Trump, despite having the best words, don’t speak so good, what with not having a Ph.D. in grammar) through misguided (it was a “joke gone bad,” said Paul Ryan, unaware apparently that narcissistic psychopaths do not have a sense of humor) to patently absurd (it’s about unification, y’all!). As the media and public storm rages on, let’s stop for a moment to remember that we are dealing with a con man who has had a lifetime of manipulation and abuse of others to practice his schtick. We are being had, again, and it may be instructive to examine how and why. A form of crazy-making, this abusive tactic used by “natural-born” manipulative abusers everywhere is meant to engender fear-based submission to the abuser. When used repeatedly, as it always is, it makes the victims lose a sense of reality and of their own agency and strength, sometimes even leading to sympathy for and an identification with the abuser (Stockholm Syndrome). Gaslighting can be done on an individual and mass scale, and Trump has been doing it since the beginning of his campaign (if not before). He also does it with predictability embedded in his character defect, as these expressions of his own aggression and calls for violence from others are eruptions of narcissistic rage which follow his personal humiliations. continue with whatever schemes he’s perpetrating at the moment. This behavior is not conscious and typically is not premeditated (although it can be), but it is purposeful (see the above objectives, esp. 4 to 6). At a rally in Cedar Rapids on the day of the Iowa caucuses, Trump offered to pay the legal fees of supporters who attacked anyone trying to throw fruit at him. “If you see somebody getting ready to throw a tomato, knock the crap out of them, would you? Seriously,” he said. “Just knock the hell — I promise you, I will pay for the legal fees. I promise. I promise.” As it turned out, there were no attempts to throw fruit at him at the rally. And last month, Trump said he’d like to “hit” speakers at the Democratic National Convention who spoke ill of him. It is worth noting that these incidents followed some major public humiliation that exposed his ineptness and dishonesty (widely publicized and disastrous interviews with the WaPo and NYT in early spring, the collective bashing at the DNC, and the latest, his inane “economy” speech on Monday). His outrageous statements thus effectively deflect attention from his glaring lack of substance and basic qualifications for any office, much less that of the American president. But as long as we debate whether he really called for Hillary’s assassination or not, we are not talking about his lack of actionable solutions to the problems he’s promising to cure. Remember, he admitted so himself when he said that the controversy is good for him. “Trump in trouble over ‘Second Amendment’ remark” (Politico). All these headlines are accurate but misleading. They don’t explain what he meant or put what he said in political context. He is right, they don’t. They do illustrate, however, how the narcissistic collusion that’s behind much evil in the world, happens: almost imperceptibly and almost with our full, though usually unwitting, participation. There is dangerous but predictable logic to Trump’s destructive behavior. And this is just a preview of things to come, should he become our president (may fates help us). Understanding what we are dealing with — a con, one in a long series of many, this time the largest of them all, perpetrated by a psychologically primitive, but skilled in abuse, conscienceless manipulator who’s driven by an insatiable desire for power and adulation — would be helpful to the media as well as the American citizens dealing with the inevitable emotional reactions of being subjected to such abuse (confusion, fear, anger, helplessness, exhaustion). We are being led by our noses; it is up to us to resist this enforced march toward an abyss. During a campaign stop in Dubuque, Iowa on January 30, 2016. The Republican presidential nominee, rallying supporters in a high school auditorium here, was talking about Chinese currency manipulation when an infant began to cry. It was an unexpected moment of tenderness from the strongman — and it lasted precisely 55 seconds. There were murmurs and some uncomfortable laughter. After attacking prisoners of war, virtually every racial minority in the United States and even the parents of a fallen U.S. soldier, it was perhaps just a matter of time until Trump got around to attacking a mother and her baby. This is obviously unsurprising. But I would like to focus on the ease (or “ease”) with which Trump switches between his pretend “benevolent” persona and his real ruthless self. I put “ease” in quotes the second time, because when you watch the clip of this performance, you’ll see how difficult it really is for Donny to fake pro-social emotions: the grimacing and the outlandish statements meant to underscore his smarmy sentiments, for which he has no internal correspondence, are a sure and cringe-inducing giveaway of the effort involved. He wants to convey care and joy, but what comes out is a barely disguised contempt. I think she really believed me that I love having a baby crying while I’m speaking. That’s okay. People don’t understand, that’s okay. Yes, sadly too many still believe that this man is what he so strenuously, at times, pretends to be: a caring and normal human being. But his always wobbly mask of normalcy slips more often these days, revealing the “Freudian junkyard” within, as one astute WaPo commenter put it. They react with “uncomfortable laughter,” but don’t know what to make of it. Donald, meanwhile, revels in his deception, as evidenced by his proud tone when he mocks the mother for believing that he cares. And “that’s okay,” because people’s naivete that comes from their ingrained goodness is what has enabled his destructive existence and rise to power so far. People with a conscience have a hard time imagining that there are those without it and don’t know what it may look like. So Donald is correct that “people don’t understand,” but no, it is not “okay.” People must wake up to the existence of psychopaths in our midst and start seeing the damage they inflict on the world. This is as good a time for it as any. The words were spoken by Khizr Khan at the DNC, where he, accompanied by his aggrieved wife, Ghazala, talked about his late son, Capt. 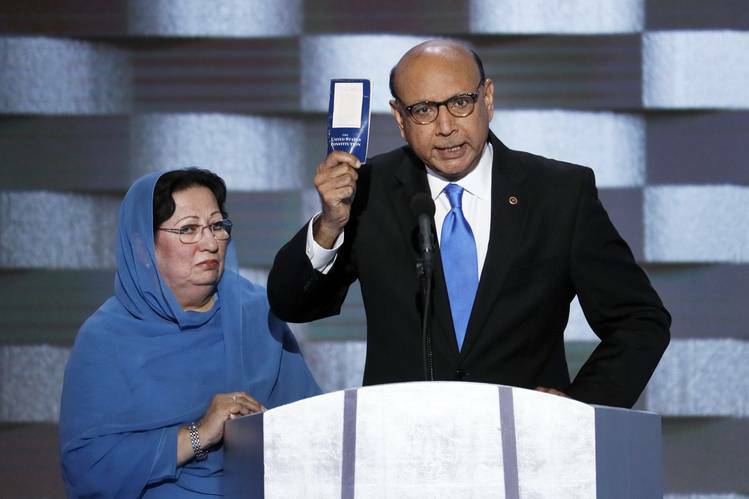 Humayun Khan, and what his ultimate sacrifice meant for the Khan family and what it should mean for others, including Donald Trump, if he had a conscience. However, bereft of conscience as Trump is, he responded, predictably, with a slew of insults, seeing himself as the aggrieved and injured one (the Perpetual Victim Complex is strong in all narcissists). This has led to an ongoing media storm of unusual, so far in this campaign, proportions, complete with (wait for it) long overdue questions about the candidate’s mental health and suitability for office. 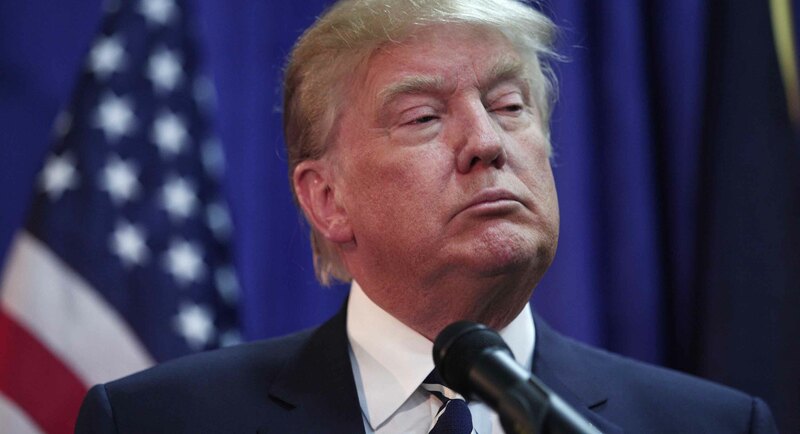 It is remarkable to watch the punditry opening their sleepy eyes to the stark raving reality of the presidential candidate’s character defect — a defect that has been on display all along and as long as Trump has been in the public eye, so at least several decades; a defect that they, American journalists, helped deepen through their adulation for, or even participation in, the narcissistic psychopath’s narcissistically psychopathic ways; a defect that has led him to this moment in history, where he is able to hijack the nation and bring it to the brink of the abyss — and he’s not even elected to office yet. Better late than never, one consoles oneself. The poignant irony of this moment cannot be overstated. It has taken two unknown grieving parents, Muslim immigrants (Muslim. immigrants. ), to present America with the undeniable contrast between human and democratic values and their utter lack embodied in Trump. Good versus evil, not to put too fine a point on it. You must watch the humble and courageous Khans to fully appreciate how different they are from the bloviating, power-hungry ignoramus whose nemesis they have become. On PBS, Mr. Khan confesses, with a mixture of pride and embarrassment, that at home they keep a supply of pocket-size copies of the American Constitution, which they give out to their guests. You can’t make this up. Just as you can’t make up the fact that the only book apparently ever read by Trump, or at least kept on his nightstand, was a collection of Hitler’s speeches. This irrefutable contrast between good and evil has caused the opinion-makers take note and wonder, finally, just what kind of pathology may be involved in such an utter lack of human values, including empathy and plain decency, as displayed by Trump. Only now they are beginning to notice what was glaringly obvious all along: that their presumptive emperor has no conscience and that this peculiar defect may carry some predictable consequences. Apparently it ain’t over — or real, or true — until a fat pundit sings.